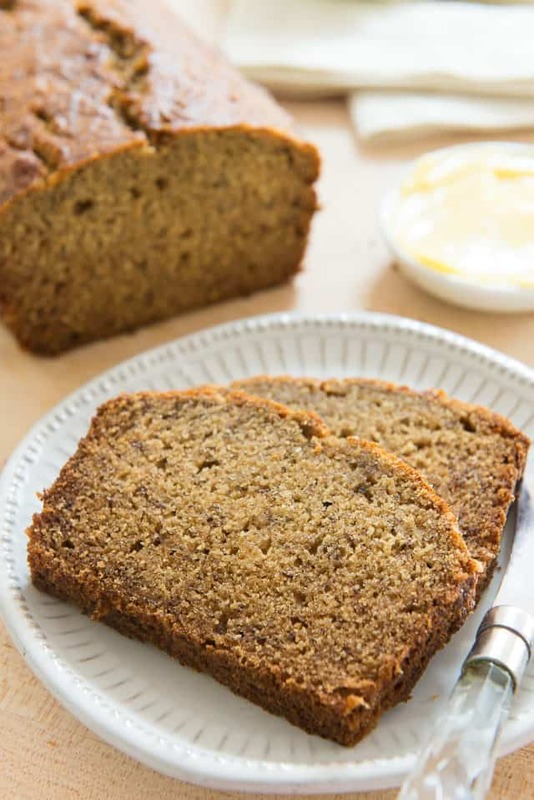 This delicious Banana Bread is a cinch to make using fresh OR frozen bananas. It has an incredibly moist texture and the perfect amount of sweetness to it. It takes a lot for me to settle on my favorite version of a recipe, as I must try ALL the combinations first before deciding what’s best. To me, this is the best banana bread of all. Coconut oil is the primary fat, which happens to make it dairy-free. The coconut oil gives it incredible moisture (and it doesn’t taste “coconutty” for those who are worried). Whole wheat flour is used for the best flavor. 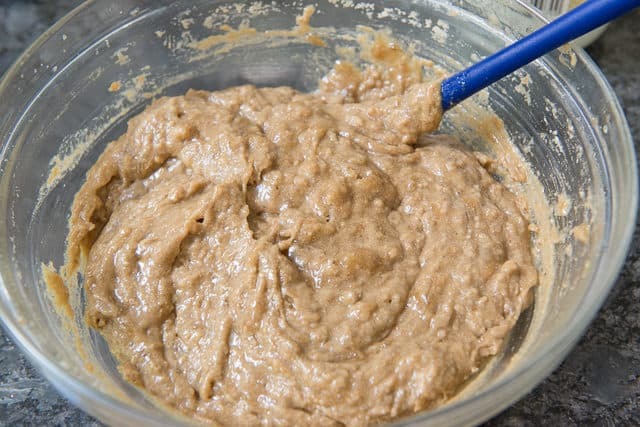 Whole wheat baked goods can sometimes have a bad reputation as tasting “too healthy,” but whole wheat flour truly tastes better here than all purpose or cake flour. Maple syrup is the only sweetener. The biggest benefit to using maple syrup over plain sugar is it adds that incredible maple flavor in addition to sweetness. 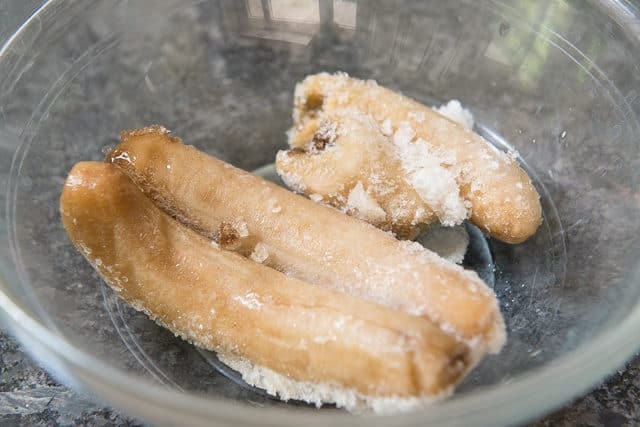 Fresh or frozen bananas may be used. I actually bake it most of the time with frozen. It’s so convenient to use frozen bananas. Every time I have an overripe banana left over that no one wants to eat, I peel it and throw it into a container in the freezer. Then I can make banana bread whenever I’ve accumulated at least 3. If using fresh bananas, mix it with the hand mixer as well, until the banana is relatively smooth. You don’t want big chunks here. 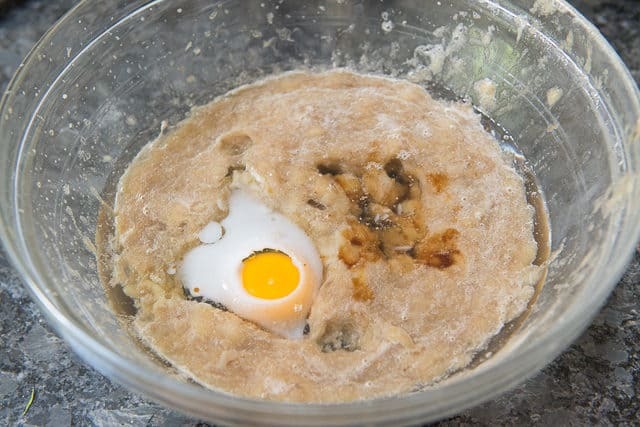 (By the way, the egg looks weird because I took too long to take a picture and the coconut oil around it solidified, but that normally doesn’t happen if you’re stirring it together in a reasonable time). Let the banana bread cool completely before slicing. Pumpkin Muffins and Lemon Poppy Seed Muffins are some of my other favorite quick breads to bake. Enjoy! 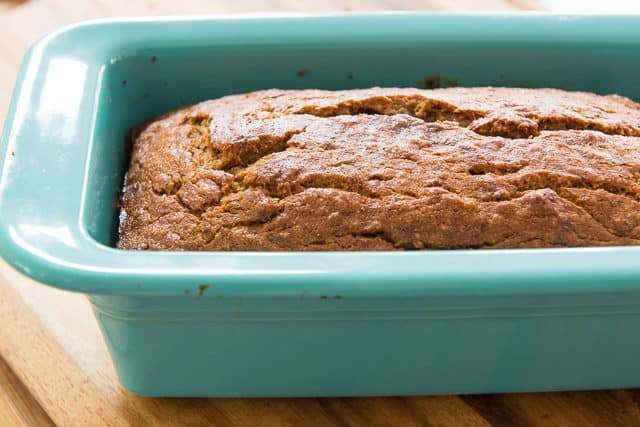 How to freeze bananas for banana bread: The bananas should be heavily spotted with brown spots before freezing. Peel the bananas, then place into an airtight container or bag. 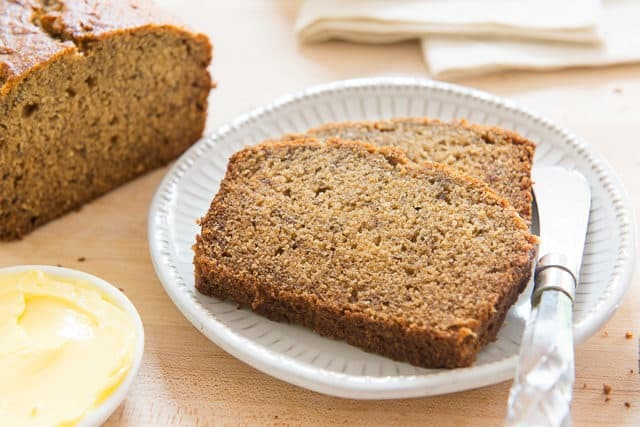 Can Banana Bread be frozen? Yes, it freezes beautifully! Store in an airtight container for up to 2 months. 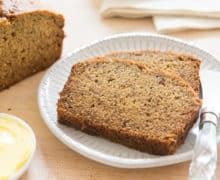 Can Banana Bread be left out at room temperature? Yes, up to 3 days. Preheat the oven to 350F. Grease an 8x4.5-inch* loaf pan with solid coconut oil. Place the bananas in a large bowl. If the bananas are frozen, microwave for about 60 seconds, until thawed. 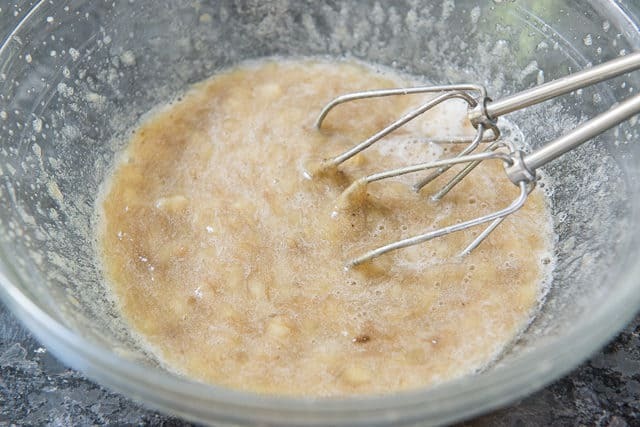 Use a hand mixer to mix the banana, until relatively smooth. No large chunks of banana should remain. Add the egg, melted coconut oil, and maple syrup. Mix until combined. 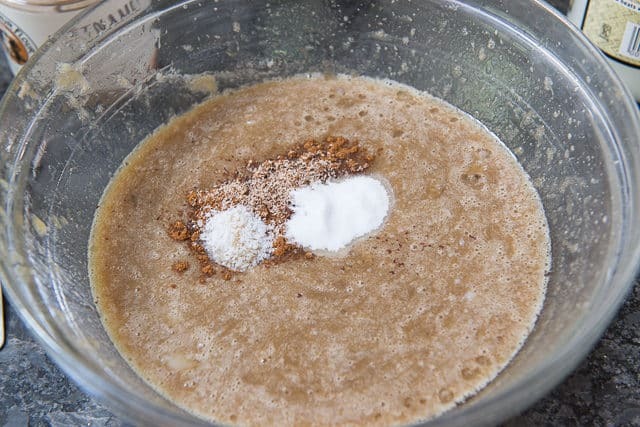 Add the cinnamon, baking soda, salt, nutmeg, and cloves, and mix until combined. 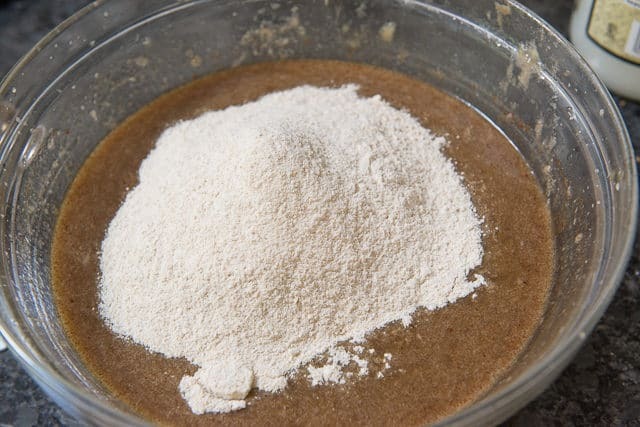 Add the whole wheat flour, and mix until no flour streaks remain, but the batter is still lumpy. 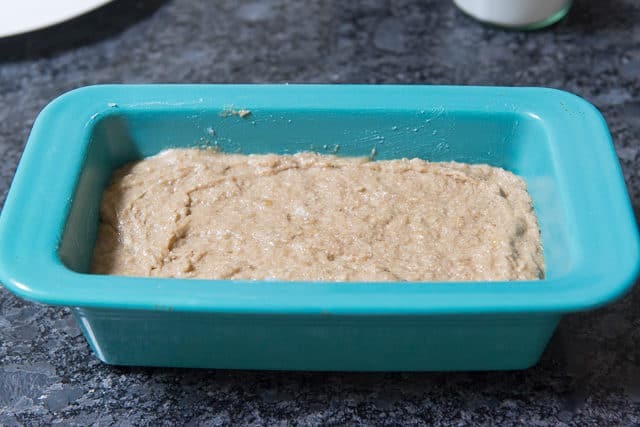 Spread the banana mixture into the prepared loaf pan, and bake for 45-50 minutes, until the crust is golden and there's no raw sheen in the cracks of the loaf. If you insert a toothpick into the loaf, it may be a little moist. Let the banana bread cool completely before slicing. Enjoy! *I've tested baking this in a larger 9x5, and it doesn't work out as well. It's a lot flatter, and the sides tend to get scorched. It's important to use a smaller pan. This recipe is a riff on Smitten Kitchen's crackly banana bread. Post updated October 2018. Originally published February 2012. This post contains an affiliate link. 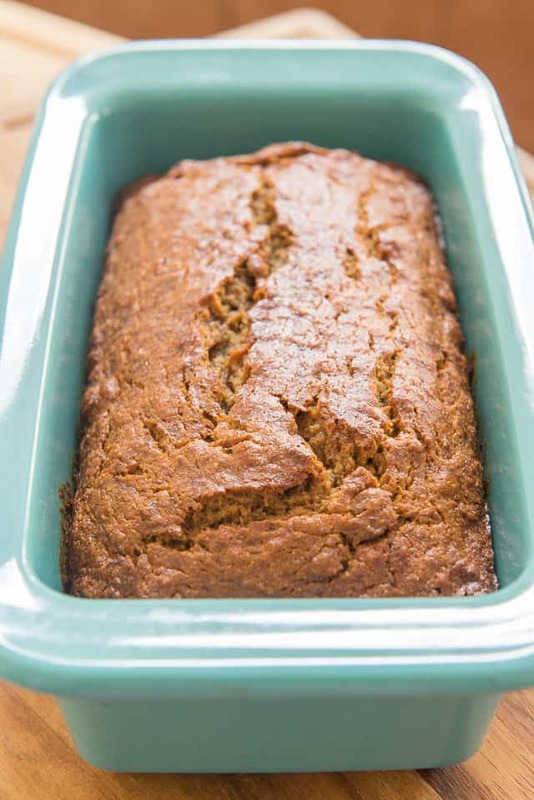 I’ve been planning to make banana bread for days now, so this is perfect! It was a sure hit in my house! My son really loved it!